American firefighter speaks about volunteering in southern Israel to help put out fires caused by incendiary kites and balloons. Aston Bright, a firefighter from Plantation, Florida, who volunteers in Israel, spoke about his experience. “I came to Israel as part of the Emergency Volunteers Project in order to help fight the fires that have been caused by Hamas sending kites and balloons and starting arson fires throughout southern Israel,” said Bright. The EVP, he explained, is an organization that sends health care professionals, community volunteers and firefighters from the United States to Israel in time of crisis. “I think it is insane when people target and attack civilians, and the Israeli people are very tough and determined. We’re here to help augment the response to those fires by coming in and dealing with them,” said Bright. “They are as professional and capable of a firefighting force as I’ve ever seen, and I’m in America where we feel we’re the best, and I would put these Israeli firefighters right there next us. They are that good,” he said. 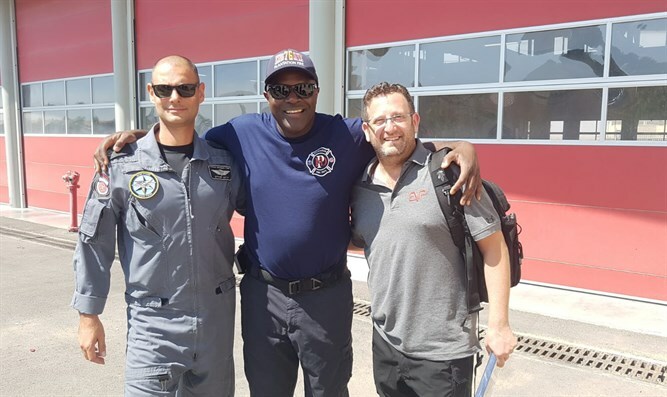 Bright noted that he would take back with him to the United States the sense of community in Israel and expressed hope that he could bring that with him and share it with his friends who are also firefighters.